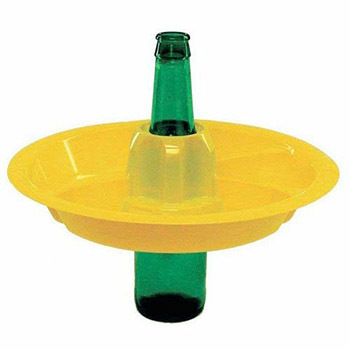 The Go Plate is a plastic plate that fits over a beer bottle, to theoretically make it easier to eat an enormous bowl of food and drink a bottle of beer while you’re standing up. The practical solution to this is multiple trips to the food line, or a table, or a ledge, or sitting down, or anything. Capitalism being what it is, if you feel this plate-and-drink setup is somehow optimal, but you drink wine, fear not: there is Wine’n'Dine, a one-handed plastic contraption that holds both food and a glass of wine. There’s even Gourmet Acacia Wood Cocktail Plates, which is a wooden version of Wine’n'Dine, with an accordingly more-expensive price tag, and charming photos of a snack consisting of eight grapes and two cubes of cheese. And finally, for the person who prefers quantity over quality, there is this 2-quart galvanized-steel funnel into which you can pour any soft food, and/or any combination of liquids, to ensure a perfect party experience. Just dump your edibles and drinkables into the funnel, and straight down it goes, foie-gras style, a half-gallon at a time. This is how we party. We out here.